While August can be a time to catch one’s breath and take a vacation day or two, corporate executives know that the annual strategic planning season is right around the corner with its team meetings, long days, spreadsheets and budgets. So before the mad rush of planning begins, I’d like to reflect on possibly the most important aspect of the strategic planning process – the external environmental assessment. Each year do you lay out your plans for revenue growth only to scramble by mid-year to make up lost ground or explain the gaps? Does your strategic plan faithfully produce a budget that needs significant revisions based on unforeseen changes by customers, competitors or suppliers? Is your strategic planning process more about ‘planning’ than it is about ‘strategy’? Have you ever explained a setback as being due to ‘events beyond our control’? Can employees logically connect their own jobs to the strategies of the company? Would you describe the assessment phase of your strategic planning process as a ‘fire drill’ with lots of activity, spreadsheets and charts but little real impact on strategic decisions? Nearly all current models of strategic planning include a formal assessment of the firm’s internal and external environment – its core competencies, markets, competition, and economic and other factors impacting its business. 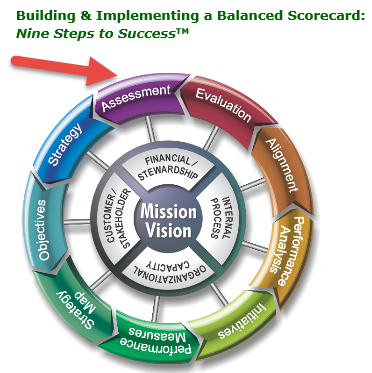 In the popular Balanced Scorecard method, for example, the Assessment phase comes between evaluation of last year’s plan and setting next year’s strategy. The Assessment includes a deep analysis of the external environment leading to a SWOT (Strengths, Weaknesses, Opportunities, Threats) that enables development of strategies that are focused on the customer needs and the value proposition. The QuickMBA website provides a simple view of the process with Environmental Scanning as the step required before any strategic planning takes place. Environmental Scanning includes an internal as well as an external analysis, which consists of a competitive analysis of the firm’s industry and the macro-environment (driving forces, trends, etc.) that impact the firm. A Forbes article for small businesses entitled “Five Steps to a Strategic Plan” puts it even more simply. Step one is called ‘Determine where you are’. The author warns, however, that many businesses get caught in the trap of seeing themselves as they want to see themselves, not how others view them. To get an accurate picture of where the business is, an internal and external audit should be performed to get a clear understanding of the marketplace, competitive environment and the organization’s competencies. The importance of getting the environmental assessment right cannot be emphasized enough. After all, the organization’s entire strategy depends on knowing who it is and where it is relative to customers and competition. The old adage of ‘garbage in/garbage out’ is relevant here because information that is incomplete or off-target naturally leads to poor strategic decisions. Instead of beginning with the internal assessment (S and W), we see many organizations turn this around and begin a comprehensive SWOT with the external assessment (O and T) because for market driven organizations it’s OTSW, not SWOT. We’ve seen that starting with the identification of external opportunities and threats leads the organization to a better understanding of their true strengths and resource and capability gaps (weaknesses) relative to future industry needs and their competitors. In addition, our strategic partner, Doug Hedlund, has taught OTSW to his MBA students since 2009 and receives continual validation that OTSW provides better external and internal insights than the traditional SWOT approach. Quite simply, an external partner can create relationships and gain access to customer and competitive information that those within organizations cannot. This is important because the ability to ‘see around corners’ and connect the dots better than your competition depends on information that may not be readily accessible. Websites, published industry studies and even your own market research surveys provide little advantage if the information and surveys can be easily duplicated by your competitors. An objective partner can also provide a unique vantage point that is critical when evaluating whether or not your ‘strengths’ are truly a source of competitive advantage or merely ‘table-stakes’. Last, an external partner has the ability to focus its resources squarely on the ‘strategy’ element of your strategic planning process and contribute context and insight from adjacent industries and other markets that you may not as easily recognize. It is critical that organizations provide adequate time for the external assessment phase of their strategic planning. In order to avoid ineffective ‘fire-drills’ the assessment should be conducted well in advance of the actual planning meetings which means that, for planning sessions scheduled in October, for example, the external assessment should begin in August or early September. For business organizations today, the pace of change is ever accelerating, driving the potential for disruption and the stakes for making the wrong move. This year, organizations that begin their planning process with a deep, foundational understanding of their external environment will be better positioned to objectively view themselves, make smarter data-driven decisions and see better alignment between their strategic initiatives and execution levers. There is no better time than this planning season to start.